Today, I am sharing a recipe for muffins, not just any muffins, low carb and yummy breakfast treats. Slowly, I am also working my way back into exercising in our gym HERE, after all I have no excuse not to work out in our amazing gym…my only excuse is laziness. 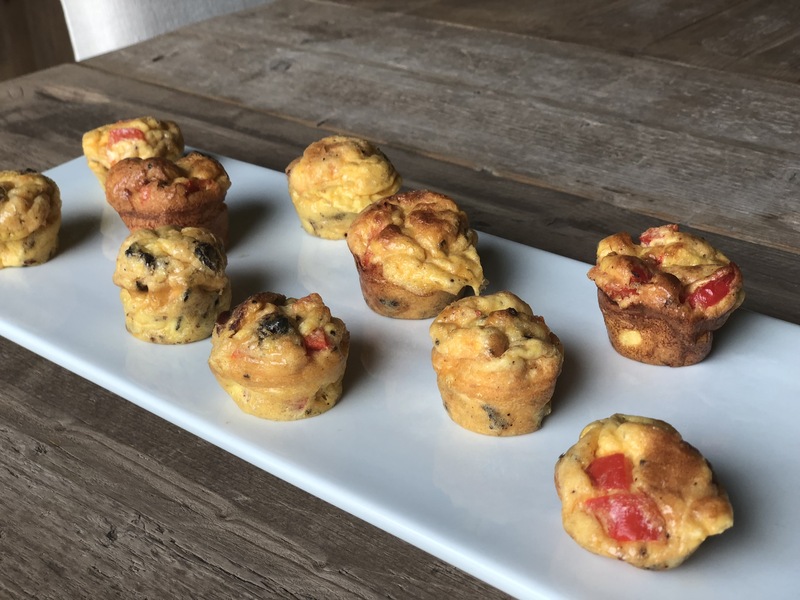 When I was on the KETO diet in the past, I did enjoy many amazing recipes and I am sharing them with you, like this Frittata Muffin Recipe! Can you really make muffins without flour? YES! These muffins consist mainly of eggs, cheese, and bacon with a veggie touch. These bite size breakfast treats reheat very well, so don’t be afraid to double the batch! To make this morning dish, you will need the following ingredients. Start, by preparing your bacon. Cut up 4 slices of bacon into chunks. Pan fry the bacon until it is crisp, and then set on paper towels to crisp further. Preheat oven to 375F. Dice 1/3 of a red pepper. In a mixing bowl combine eggs, cream, bacon, cheese, bacon fat, red pepper, garlic, salt, and pepper. Distribute the mixture evenly between 6 holes in a regular size cupcake tray or 12 in a mini muffin tray. Put these in the oven for 20 minutes or until fluffy. If you want, you can broil the top of the muffins for 2-3 minutes before you take them out to cool. Enjoy your breakfast treats with a cup of coffee or your favorite tea. Subscribe to Happy Haute Home to receive low carb recipes right to your inbox, and follow along on Pinterest HERE, and Twitter HERE and feel free to pin and tweet your favorite pics from Happy Haute Home. Previous Post How to Host an EPIC House Party! I love these! I’ve made these a bunch of times!! Great for breakfast on the go during the busy work week! Right?!! Glad you like them too Toya!